C.R. Rao would be found in almost any statistician’s list of the five outstanding workers in the world of Mathematical Statistics today. His book represents a comprehensive account of the main body of results that comprise modern statistics theory. C.R. Rao, Eberly Professor Emeritus in the Statistics Department at Penn State is a towering figure in the postwar development of statistical theory. Among his great many honors, he was recently awarded the National Medal of Science, the government’s highest scientific prize. C.R. Rao is among the worldwide leaders in statistical science over the last five decades. His research, scholarship, and professional service have had a profound influence in the theory and applications of statistics and are incorporated into standard references for statistical study and practice.C.R. Rao is not only a highly creative theoretician, but was attracted and labored with many data sets in health, biology, psychology, and social sciences. Among the international community of scholars, you are widely acknowledged as one of the world’s foremost statisticians. In the complex realms of statistics and higher mathematics, your research and scholarly writing have opened new doors of understanding. The statistical theories and applications, which bear your name, attest to the fundamental contributions you have made to your field and to the larger body of man’s knowledge. Numerous honors and awards have followed, in tribute to an unusually distinguished and productive life of inquiry. You have earned the highest accolade of all, the esteem of your peers throughout the world of scholarship. Government has appointed C.R. 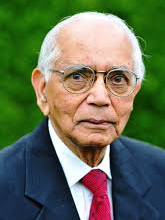 Rao, an eminent statistician, as National Professor. Professor Rao is an outstanding and creative thinker in the field. He was appointed by Professor Mahalanobis as full-fledged professor of the Indian Statistical Institute at the early age of 29 in recognition of his creativity. …as the world’s leading expert in statistical design theory. C. Radhakrishna Rao is a polymath amongst statisticians. …Rao’s research interests include social, industrial and economic applications. He has been (and still is) an influential teacher especially in third world countries. …The group of papers are interspersed with quatrains from Rubaiyat of Omar Khayyam of Naishapur, whose hedonistic nihilism seems to accord ill with C.R. Rao’s outlook:” Myself when young did eagerly frequent/ Doctor and Saint ,and heard great Argument/ About it and about: but evermore/ came out by the same door as I went”. Those of us who have frequented C.R.’s company have invariably found new doors open.